Our blogging has been a bit slow this year but Team Ipswich Makerspace has been very busy beavering away on our new robot. Once again Keith is designing TractorBot (possibly being renamed this year) in Fusion360. Keith has had trouble with files becoming corrupt in previous years, but with 2 x PiWars worth of experience things are going well so far. The model is even parametric, believe it or not the two images below are renderings from the same model, just with a couple or parameters edited to change the primary dimensions. 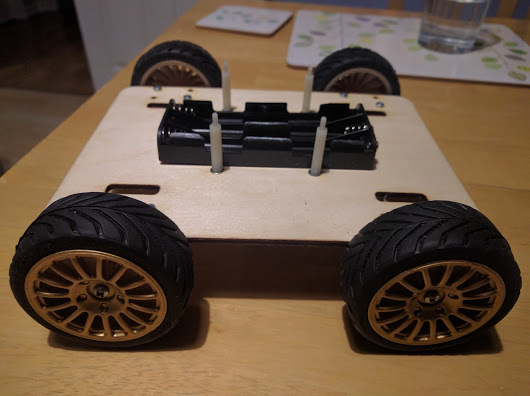 We started off using micro metal gear motors, and this is what we thought it would look like, once again using the trusty 7.2v NiCd batteries. And the first hardware was born. And little while later we had movement. It’s always good (and a relief) when you see a robot move for the first time. TractorBot 2017 from Keith Ellis on Vimeo.